In my studio: Who said things couldn't be for free? We are renovating the farmhouse on a budget. Essentially, all that we have bought so far is paint, paint, more paint, a little piece of carpet, some hardwood flooring, a fridge, a freezer, a wardrobe and two IKEA couches. The rest of what we have done and put out there haven't cost us a penny. 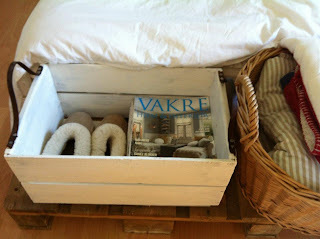 The bed is made from old pallets with an old door, found in the barn, as a headboard. The kitchen is all repainted. The coffe table is an old one with a fresh coat of paint, and the shoe rack in the hall was built from scrap wood from a saw mill that is no longer running. The bedside tables are old chairs that were already in the house. 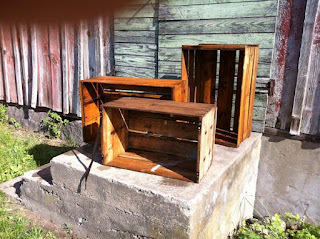 We have refurbished all of the kitchen cabinets, and we have been given some old, shabby-looking furniture from our friends and relatives. And that's great, because that's how we like it. It hasn't cost us much, in other words. We have taken on a lot of junk, and made it useful in our home. P is such a junk-finder, and I've always been teasing him for it, but as it turned out, I've become just like him. Junk is good, and if it's free junk, it's even better. Take these fruit crates, for instance. A friend of mine had them in her barn, and she had no idea what to do with them. So she gave them to me (along with lot of other stuff she thought I might be able to use). One of my summer projects this year was to scrub them off and take them inside and make something of them. One became white, and got it's leather handles fixed, and thus became a pretty nice piece for storing some inpiring magazines and my favourite sheepskin slippers by the bed. It didn't cost more than the paint and some nails for fastening the leather straps. The other two crates are now storing matches, old newspapers (for kindling) and firewood by the fireplace. So, one person's junk can be someone elses treasure. Sometimes you need some paint to fix it up, and sometimes not even that. Free is great, right?